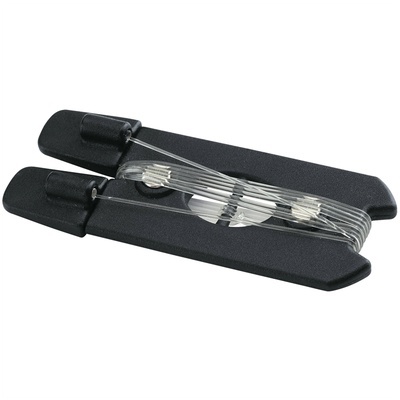 Product #46600 | SKU 11590 | 0.0 (no ratings yet) Thanks for your rating! Unobtrusive, virtually invisible, and simple-to-use, the black Sheet Music Holder for Music Stand from K & M consists of a base section with integrated magnets, which is secured under the sheet music rest. The two caps at the ends of the transparent rubber lace are plugged onto the ends of the opened-out sheet holder on the sheet music rest. This patented sheet Music Holder helps to securely hold opened sheets, music books, and folders. Music and text can be read through the transparent lace and the pages can still be turned. This sheet Music Holder is suitable for the König & Meyer's Baseline and Topline music stands. Compact and easy-to-use, this small sheet music holder can be transported and folded, while on the stand.